Far East Adventure Travel The Podcast is brought to you by Far East Adventure Travel Magazine. Gokyo Valley, Nepal-World’s Best Kept Trekking Secret is now on the iTunes Newsstand. Subscribe now and it’s free including all previous issues. Go to the App Store or breezy-size.flywheelsites.com to download the app and subscribe. Yanshui, Taiwan located 45km north of Tainan, in the southern region of the country holds one of the most interesting chaotic festivals in the world on the 14th and 15th of each Lunar New Year, The Yanshui Beehive Fireworks Festival. Even if you don’t have a map it’s pretty easy to find your way to the beehives. Just follow the fireworks, explosions and the streets that are lined with food stalls everywhere here. Hey it’s a war zone, but you still gotta eat! With the use of Taiwan’s efficient train system it’s a breeze getting to Yanshui District. If you’re traveling from Taipei you can board a southbound train to the Xinying station and either take a taxi to the center of town or go directly to the local bus depot across the street from the train station. Some years they even have a free shuttle. The Beehive Fireworks Festival coincides with the Lantern Festival held on the 15th day of the Lunar New Year. An ancient ritual that has many origins one of which is the celebration of the declining darkness of winter. It’s not long before I find my first beehive, all be it a smaller one. You’ll see The War Gods carried in glass palanquins throughout the festival area. They are the eyes of the Deities of heaven, ensuring everything is safe, at least from epidemics. The beehives are stacked with bottle rockets and firecrackers in most cases. Fireworks are blasted in the sky before the beehive is ignited. It’s always an exciting tense moment. I started off at a distance from this one moving in as the beehive is lit. As I got closer the noise from the blasts of the bottle rockets whizzing by adds to the nervous energy. People shuffle their feet, it seems like a natural movement to help cope with the environment and the possibility of fireworks exploding under you. Everything is firework based here. Firecrackers play an important role in Chinese and Taiwanese culture used as a way to drive or scare evil spirits away. In the case of Yanshui, to also ward off a disease. It was 1885, and medicine was not developed enough at the time to handle a devastating cholera epidemic. Locals prayed to Gaun Di, the God of war, and carried him in a glass palanquin through the streets of Yanshui. The faithful set off firecrackers all along the road all through the night ultimately ridding themselves of the plague in one fell swoop. Today many believe the baptism of fireworks rids one of troubles, sweeps away noxious influences and brings good luck for the new year. I was up for a good baptism and a lucky year so I followed the largest crowd I had seen that night heading in the direction of a major beehive. A giant Gaund Di, presided over this spot so I knew a significant explosion was about to take place. Fireworks in the distance lit up the sky signalling other explosions but it was still quiet by Yanshui standards around this beehive. The box full of bottle rockets and firecrackers was 2.5 meters wide and at least 1.5 meter high. Many fireworks and beehives would be ignited over the course of the evening festivities. 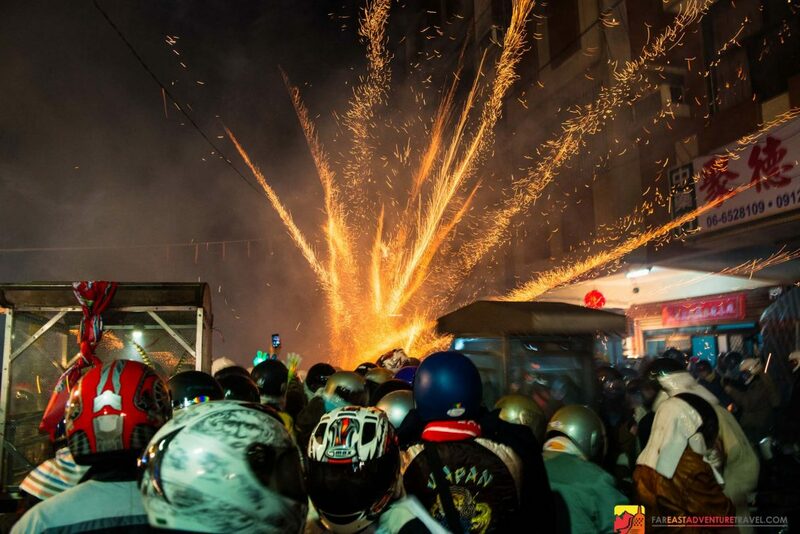 In one year Yanshui District estimated they would set off over 1 million firecrackers alone during the festival. Everyone here is prepared for the thousands of bottle rockets and firecrackers that are about to be set off chasing the evil spirits away for another year. I had been to the Beehive Festival before but never so close to the action. I am even more nervous-questioning my proximity to the box and the danger I could be in. The whistle is blown and we are given the wave that this beehive is about to go off. A series of fireworks are lit down the street and the crowd noise is dulled to a very low hum in anticipation of the massive release of bottle rockets and firecrackers. As you can see I was pretty close to the beehive. After the first bottle rockets were lit I decided to back off so I retreated a couple of meters. At this point we all became enveloped in the smoke and extreme noise. Rockets were fired in the opposite direction but you will see some whiz by. Firecrackers exploded at my feet and I was hit by a couple of bottle rockets which felt like a punch in the arm. I decide to move in a little closer to get a better view of the source noticing that the small group at the front all had their backs towards the beehive, further raising my anxiety level. This was when all hell broke loose. I could only stand in the middle for a few seconds before the force of the rockets drove me slightly away from the center. A combination of fear, adrenaline, and excitement was racing through my mind and body. It was the most chaotic atmosphere I’d ever experienced. Finally it seemed the last of the bees had fled the hive, only a few were left to retreat along with some slow detonating firecrackers. Piles of firework remnants lay everywhere. The smoke was strong and lingering. The huge crowd like a wave immediately shifted in another direction. We were signalled to make way for a glass palanquin with a war god or general inside as it’s raced off to another beehive. The explosions continued. Back in the night market area fireworks could be seen in the sky from every direction. Another beehive is lit close to the main walkway and people, especially those without protection scatter and run in the opposite direction. Far East Adventure Travel The Podcast is brought to you by Far East Adventure Travel Magazine. One of my favorite trekking regions in Nepal, The Gokyo Valley is featured in the latest issue. It’s free on the iTunes Newsstand. Search Far East Adventure Travel in The App Store-download the app and subscribe. That’s it for this week’s episode, thanks so much for joining me. Until next time this is John Saboe-safe travels and Namaste!